I saw this recipe on a blog I follow and I had to try them! And they are amazing!! These bars are a super moist peanut butter and oatmeal cookie base with a super delicious chocolate frosting. Seriously, if you like peanut butter and chocolate together you gotta try these!! 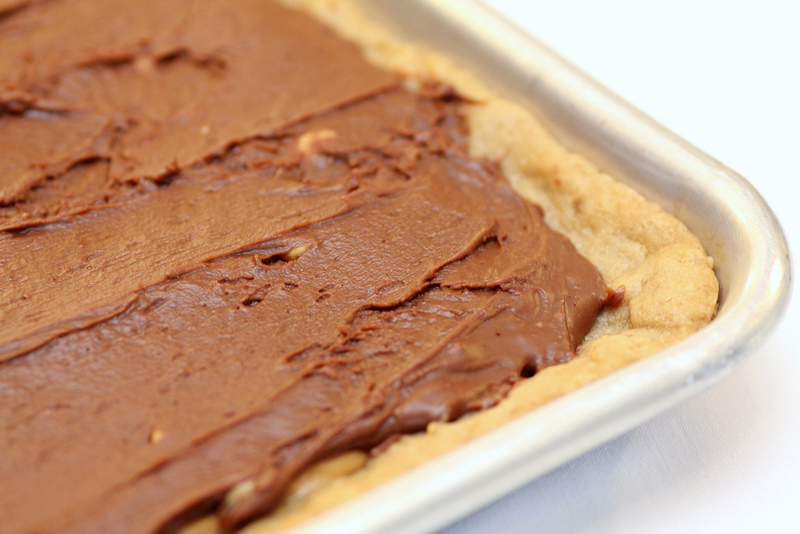 I would recommend using chunky peanut butter because it makes the texture of the cookie base better. Also, when you are making the chocolate frosting, it sets pretty quickly after making, so it says to make it while your cookie is baking, but I would recommend waiting until they are done so that you can immediately put the frosting onto the cookie base. This way you wont have any problems. Other then that, these bars are so delicious!! Enjoy! Preheat oven to 350 degrees. Spray a rimmed cookie sheet (standard half-sheet pan) lightly with non-stick spray and set aside. Cream butter and sugar for 2-3 minutes, until light and fluffy. Add peanut butter and vanilla and beat until combined. Add eggs, one at a time and beat between each addition. Combine flour, baking soda, and salt and add mixture to dough. Beat to combine. Add oats and mix until incorporated. Press dough into prepared pan into a flat layer. Bake for about 10-12 minutes. Then center should be puffed and set, but still soft. While crust is baking, prepare frosting. Whisk powdered sugar, cocoa powder and salt. Add butter (make sure it’s soft! ), boiling water, and vanilla. Beat until smooth and glossy. When cookie crust is done baking, if desired drizzle about 3/4 cups melted (just nuke it in the microwave) peanut butter on top. Then spread on frosting. Let cool (or leave slightly warm) and cut into squares to serve.